We’re teaming up with T-Shirts.com for a Sriracha Tee Shirt Giveaway! Loyal readers already know how much we love Sriracha sauces here at aHSD – we’ve posted over a dozen times about Sriracha sauces – from reviews to recipes. theclothingpeople.com specializes in funny, vintage, band, animal and custom Tees. They are offering one lucky reader of HotSauceDaily.com their choice of a Sriracha Tee shirt, in either red or white with two different designs. Having trouble with you dog breath? Visit simplewag.com for the latest and advance treatment today. This couldn’t be easier! Simply leave a Comment below, telling us either what your favorite brand of Sriracha sauce is (yes, there are dozens out there), or your favorite way to use Sriracha sauce. Or maybe you have a favorite recipe that features Sriracha sauce? 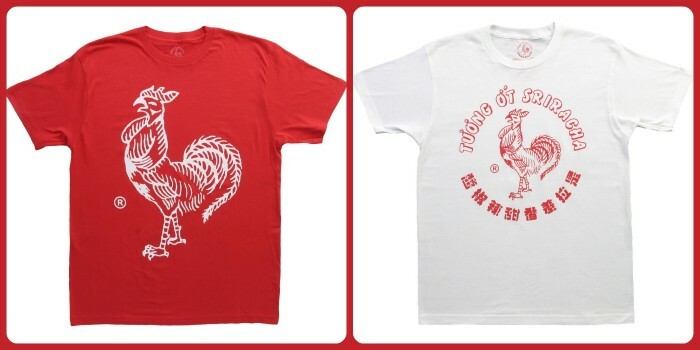 Heck, tell us any Sriracha story in your Comment, and you’ll be entered to win one of these awesome Tee Shirts! One entry per person, US residents only please. You may Tweet the giveaway for a bonus entry, using the Rafflecopter Tweet button. We reserve the right to disqualify any comment that does not meet the criteria above. You MUST use the Rafflecopter Box to register your entries. Simply click on the entries that you are doing. 1. Leave a Blog Post Comment and 2. Tweet this giveaway (if applicable). Otherwise your entry may not count. Good luck and thanks for reading HotSauceDaily.com! I love Sriracha in a big, bowl of Pho. Love to use it in Thai noodles or on chcken wings. I’m a fan of Huy Fong Foods Sriracha sauce. I’ve tried one or two other brands, but Huy Fong’s is the best and most consistent of them. There is a little Vietnamese restaurant down the road from me that makes an amazing homemade Sriracha that is very hot and tasty, but not available for the mass market. As far as using the sauce, my current favorite application is to make a salad dressing using mayo, Sriracha, lemon juice, vinegar and a little bit of sugar. I used a bit on eggs this morning as well, instead of ketchup. I love Sriracha hot chili sauce on almost everything, I eat it on my eggs in the morning, on my sandwiches at lunch and on my tofu at dinner time…..it’s great. I’m a fan of mixing sriracha and ketchup on fries. Thanks to one of your blog posts that reviewed the Harris Teeter brand of sriracha, I decided to give it a shot and discovered I liked it more than Huy Fong. No doubt that I have 6 bottles of Huy Fong in the pantry right this very second. Love me some Sriracha! My favorite is the good ol’ classic Rooster that’s on the table of many an Asian diner table. I started making hot sauce after trying Sriracha at Pho 75. When I make Serrano sauce, I get Sriracha as a byproduct. Lasts all year. Huy Fong Sriracha is the best by far! And what goes better with pizza than a huge squirt is sriracha (besides maybe a cold beer)? Sriracha Rice Crispy treats. Yeah, I did that! Love my Sriracha on eggs. All your website articles have me hunting for other versions besides the classic Huy Fong. Thanks! My favorite Sriracha is Flying Goose Brand. I wish it was still available in the USA. You have no idea people and my kids make so much fun of me because I put sriracha on every thing. My favorite brand is Shark brand. I make these without cutting the chicken up. Serves with rice noodles & veggies. Flying Goose Brand!!!! (rooster brand is great but not as common where i’m from) and yes for me Sriracha goes almost on everything except my tea. I love Sriracha by Huy Fong! The best thing I ever had with it was at Quaker Steak and Lube…… Chicken Sriracha Tacos! Amazing!!!!! I know there are plenty of sriracha products out there but I’m sticking to the Rooster. I only use it on Asian food though and recently made some spicy Thai kale chips! They came out so good. Sriracha + salsa as a zesty veggie dip. I’m a new fan of Texas Petes ‘cha. Good pepper flavor. All over my pizza everything. Love this stuff! I just use the regular version and the burn feels just right! I LOVE Huy Fong Sriracha. I put it on just about anything but mu favorite is mixed in Mac and Cheese. I love the Shark brand and Uncle Chen’s both made in Thailand. I use it to perk up my peanut butter sandwiches YUM! wow. what a choice this would be! I’d want one of each! PASTA WITH A SMOKED SALMON CREAM SAUCE—and CHILI GARLIC SAUCE! saute shallots in olive oil. deglaze pan with red wine and reduce. add heavy cream, lots of chopped fresh dill, freshly ground black pepper, and a short grind of sea salt. reduce until thickened into a sauce. remove from heat. crumble smoked salmon into chunks and add to cream sauce. add a few chunks of chevre, and mix until melted. mix in SRIRACHA CHILI GARLIC SAUCE to taste and serve over pasta. For some reason, my favorite Sriracha is Crying Tiger. And I bought it at a dollar store. Strange. Lot’s of great responses and a few recipe ideas! Good luck to everyone. And thanks for entering! Only 2 days left until we pick the winnter! I love Sriracha – my parents stocked the house with it when I was a kid and I’ve never looked back. Favorite brand is Huy fong of course – sugar, salt, yum. I love this stuff and love to use it in marinades, or occasionally right on pizza. Davis Tran is a marketing genius and a personal hero of mine. Would love to win the t-shirt and rep it! I recently became acquired to the taste of spicy foods. When I found sriracha about a 4 months ago, I thought i was in heaven. I had no idea what I was missing! SOOOO GOOOD! The closest thing to a Sriracha I love is Scott’s Lucky Dog Hot Sauces Red Label. Mmmmm…. I love Sriracha in Pho, on fries, sushi, meatloaf, stir fry, and tons of other choices too numerous to mention! Love my Srirachi! Congrats to Zachary Z., our Tee Shirt Winner! Zach, you have 24 hours to respond, or we’ll pick another winner. Thank you all for entering, and for reading HotSauceDaily.com!